You probably didn't even realize that today is the first day of our country's 3rd annual Fix a Leak Week! Okay. I admit it. I missed the first two Fix a Leak Weeks entirely, but now that I am trying to be more eco-conscious, it seems like a great idea to pass along. During the week of March 14th – March 20th, the United States Environmental Protection Agency (EPA) Watersense Program encourages all citizens to check their home plumbing for leaks and get them repaired. Nationwide, more than 1 trillion gallons of water leak from U.S. homes each year. That's why WaterSense reminds Americans to check their plumbing fixtures and irrigation systems each year during Fix a Leak Week. If you have an in-ground irrigation system, check it each spring before use to make sure it wasn't damaged by frost or freezing. 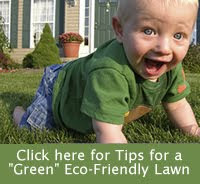 Or hire a WaterSense irrigation partner to inspect things for you. These professionals have passed a certification program focused on water efficiency. They will not only help you detect and correct leaks in the system, but also maximize its efficiency.